The following is a description of the installation procedures associated with the RPB Type-J rudder seal. Installation instructions are included with each unit and should be followed closely. Inspect that area of the rudder stock where the lip seal will rest and confirm that there is clean, smooth stock available to accept the lip seal. Block the rudder into position and disconnect the steering arm and rudder collar. Remove the blocking and carefully lower the rudder so that the rudder stock is beneath the upper rudder bearing. Confirm that there is sufficient clearance between the end of the stock and the underside of the shelf to add the Type-J unit. Remove the packing nut (and backing nut, if present). To ensure proper thread size in the finished Type-J, send the backing nut to Tides when placing your order. It will be returned with your unit. Remove the flax packing. Inspect the upper end of the rudder stock. Remove any burrs, nicks or sharp edges which might damage the lip seal during installation or operation. Replace the backing nut and thread to the bottom of the bronze rudder port's threaded barrel. Insert the red installation hat completely into the Type-J making certain that it covers the thin sealing edge of the lip seal. Coat the rudder port threads with thread sealant. Carefully jack the rudder back into position. The rudder stock will pass through the red installation hat and upper bearing. Block in position. 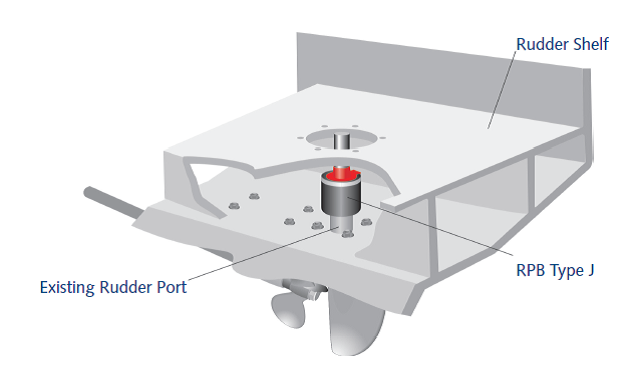 Reconnect the steering arm and rudder collar. Note: Before installing the rudder, insert the red installation hat into the lip seal. When rudder is in place, remove, invert and replace it on top of the Type-J unit to keep debris off the lip seal during use.